I have been doing a lot of research on investing and finance lately and have come across a lot of information that is extremely concerning and shocking. The global economy is in much worse shape than I had originally thought and Canada while regarded as a safer place than the USA appears to be in just as bad fiscal shape! It appears the global economy is headed straight down the toilet for the next decade or so due to a massive accumulation of un-payable debt. What sparked a lot of this off is watching the Crash Course series on Chris Martenson’s website. Mr. Martenson spent several years dedicated to figuring out how the fiscal economy works and how money is created and spent. Crash Course is for the lay person and I highly recommend watching it. What this spells out is large systemic collapse of the global economy in the near future. Nearly all democratic developed nations are at fault for racking up massive debt. Socialist governments spend to much on social programs…Conservative governments spend to much on their Military. Combing the above levels of debt will give you a Nation’s total debt. A number very few people seemingly know for any nation. 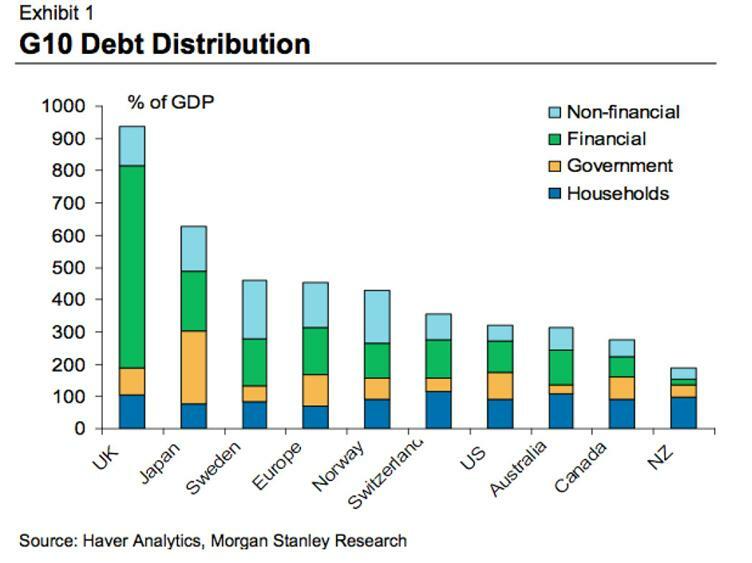 Let’s look at the debt numbers for a few select countries. Absolute numbers will also be compared to GDP and other ratios for a rough guestimate for the ease of paying debts off. New Zealand ~ 450 billion….total debt to GDP is 337%??? What does this all mean? It appears the global economy is on the verge of a systemic collapse. The goal for me now is to try and figure out how the whole thing will come down and what the best way is to prepare for it. When governments are having a difficult time paying the interest on their debt and getting their credit rating downgraded you know we are in serious trouble. Another aspect to this is Central Banks are keeping interest rates super low. By keeping interests rates low they are ENCOURAGING people to take on MORE debt, since loans are so cheap! The effect of this is that it also PUNISHES people & corporations that SAVE. The net effect is that it rewards people who are reckless with money and penalizes those that are prudent. This is what happens when you try to stimulate a debt choked economy by creating more debt! Central banks are doing their best to run the economy into the ground FASTER. Defaulting on debt…going bankrupt. Money disappears into thin air. People & businesses run the highest risk of defaulting. This causes deflation. Paying off debt by printing more money out of thin air. Governments can do this and they can also bail out people/businesses via handouts to banks. This causes inflation. Inflation & Deflation will be the primary metrics that define the future of the global economy over the next several years. So the big question is….with all the debt having no hope of being able to be paid off, will the currency of a given country deflate or inflate? The crazy thing about all of this is how the crises is being managed. As the economy takes a downturn, central banks are lowering interest rates making it easier for people to borrow money in hopes of stimulating the economy. The effect is the debt load gets increased dramatically. As the debt goes up, and people start defaulting banks require bailouts which is more debt. And the cycle continues. Banks aren’t held accountable for the loans and especially mortgages are insured by the government plus they are to big to fail. Thus banks have virtually no incentive to giving out less loans. In fact its just recently been made more lucrative. This exacerbates the problem of continuous debt piling. Oh there is a cliff up ahead and were heading straight for it…!!? I know….lets step on the gas!! Global hyperinflation or a deflationary spiral destroys the global economy and results in total Anarchy – we return to the Dark Ages. Start growing your own food & get a bow and arrow. Move somewhere warm. Norway & Sweden both in a asset bubble?